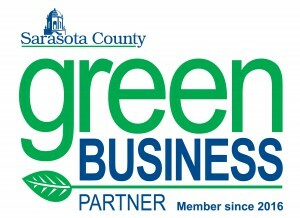 Please welcome the Sarasota County Green Business Partnership Program’s newest member, Zildjian Catering and Consulting. As a green business partner, Zildjian Catering can be best described as a business that strives to have a lighter footprint by ensuring that nothing goes to waste. From composting in the kitchen to single stream recycling, owner Alyson is committed to going the extra step for her clients. For catering events, Zildjian uses products that are either recyclable or compostable. These include compostable cups, plates and silverware. They also use items made from fallen palm leaves and sugarcane that have been made into plates and bowls. Supporting our community is a major part of Zildjian Catering. They work with numerous local groups and farmers, including the Sarasota farmers market. Chef/Owner Alyson Zildjian has been working and creating in the food industry for over 25 years. Her clients range from Fortune 500 companies and rock legend Aerosmith, to corporate and private clients celebrating their Achievements, B’nai Mitzvahs, Weddings, Birthdays, Anniversaries, Gala’s and Debutante Balls. Alyson has also done extensive research on developing recipes and menus for people with special dietary restrictions, especially those needing gluten free options. She sits on the Board of Slow Food Greater Sarasota and the Edible School Garden Committee. Her passion for local food keeps her menu’s exciting and interesting using local organic ingredients in season as much as possible. This summer she was invited as one of 6 chefs in Florida to the Small Farm Conference in Kissimmee, Florida to show case her talents and support the local farming industry. You can also find her on Channel 7 ABC news as a guest on “Chef Judi’s Dish” during the year. Zildjian Catering and Consulting offers Themed Cooking Classes, Corporate Team Building Programs, Private Cooking Lessons in your home, Cooking Parties and of course, Full Service Catering and Event Planning. Zildjian Catering sets themselves apart by providing impeccable service and food that is not only fresh, healthy and delicious, but, is always presented beautifully, by adding unique touches that will leave their guests talking about it for years!